SOXX index ETF was very successful until March 2019. A short review on the 5-Layer forecast model (showing 3 of 5 layers) indicates that a downtrend is coming soon. 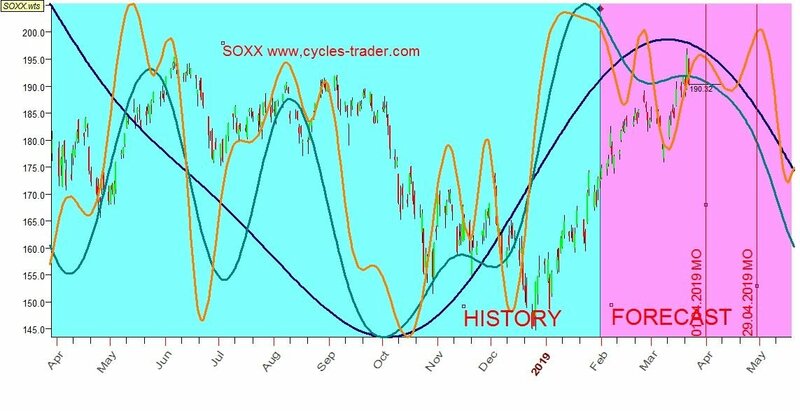 A downtrend trigger could very well start at the begining of April 2019, the stock/ETF may recover until begining of May 2019 and then continue downward. This picture shows 3 months of forecast using the 5-Layer model, with 2 months real price, indicting that the 5_Layer model is working well with this price instrument. Order the forecast to see beyond this date.